General Reportedly Used Psy-Ops On American VIPs : The Two-Way Few people would think that U.S. lawmakers who visit Afghanistan see the place through the eyes of the average grunt. But the idea of using psychological-warfare techniques to influence VIPs seems crazy; in fact, it's illegal. But it happened last year, according to a feature in Rolling Stone. 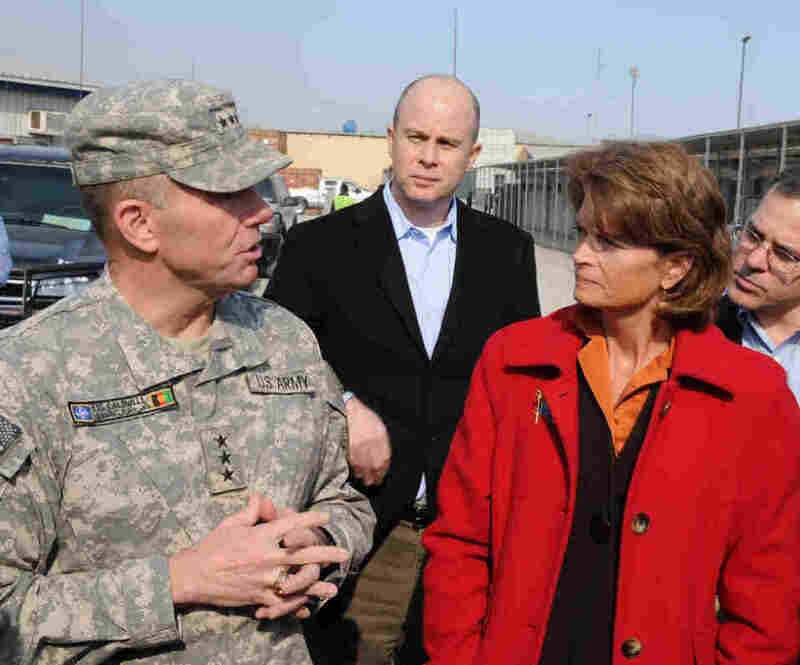 Lt. Gen. William B. Caldwell takes Sen. Lisa Murkowski on a tour of a Kabul training facility, Jan. 9, 2010. The general has been accused of using psychological profiles to influence American visitors to Afghanistan. Few people would think that when U.S. lawmakers visit troops in Afghanistan, they're seeing the place through the eyes of the average grunt. But the idea of using psychological-warfare techniques to influence senators and other VIPs seems crazy — and in fact, it's illegal. But it happened in Afghanistan last year, according to a feature in Rolling Stone. Call it the Inception effect. Perhaps taking inspiration from the futuristic film's story of planting an idea in the subconscious of influential people, Lt. Gen. William Caldwell ordered his "Information Operations" unit to recommend ways to influence the thoughts of distinguished visitors, according to the article by Michael Hastings. Caldwell is in charge of training Afghan's military — a huge task, and an expensive one. According to the article, Caldwell ordered his Information Operations unit, led by Lt. Colonel Michael Holmes, to target VIPs who met with Caldwell during their visits to Camp Eggers in Kabul. There's just one problem with that: It's against federal law to use propaganda against American citizens. The law in question is the Smith-Mundt Act, which was adopted in 1948, at the start of the Cold War. The law was meant to keep the State Department from using Soviet-style propaganda techniques to influence the American public. But in Afghanistan, Caldwell wanted to know the best way to influence his visitors, who included Sens. John McCain, Joe Lieberman, and Al Franken, as well as Admiral Mike Mullen of the Joint Chiefs of Staff. According to Holmes, the general wanted the IO team to provide a "deeper analysis of pressure points we could use to leverage the delegation for more funds." The general's chief of staff also asked Holmes how Caldwell could secretly manipulate the U.S. lawmakers without their knowledge. "How do we get these guys to give us more people?" he demanded. "What do I have to plant inside their heads?" "We called it Operation Fourth Star," says Holmes. "Caldwell seemed far more focused on the Americans and the funding stream than he was on the Afghans. We were there to teach and train the Afghans. But for the first four months it was all about the U.S. Later he even started talking about targeting the NATO populations." At one point, according to Holmes, Caldwell wanted to break up the IO team and give each general on his staff their own personal spokesperson with psy-ops training. It's unclear what effect, if any, the "psy-ops" may have had. But the article notes that when Gen. Caldwell asked the Obama administration for billions of dollars to train Afghan troops, his request gained the support of "Sen. Carl Levin, one of the senators whom Holmes had been ordered to target." Caldwell told Rolling Stone that he flatly denied the allegations that he "used an Information Operations Cell to influence Distinguished Visitors." But in his piece, Hastings lays out two possible wiggle-spots that the general might be counting on. First, an order seems to have gone out that the profilers would only use publicly available information when they worked up recommendations on influential Americans visiting Afghanistan. And secondly, the general's staff ordered that the "information operation cell" would now be called the "Information Engagement cell." Hastings writes that Caldwell's staff engaged in an information campaign of its own, seeking to discredit Holmes — who was also given an official reprimand. That effort led to allegations that Holmes not only spent too much time on Facebook, but that he had an improper affair with a junior officer — a charge that may eventually derail the careers of both Holmes and the other officer, according to Hastings. Update at 2:20 pm ET: Petraeus Orders Inquiry. NPR's Tom Bowman reports that Gen. David Petraeus, the top U.S. commander in Afghanistan, has ordered an investigation into the allegations raised in Rolling Stone. According to the AP, "Pentagon spokesman Col. Dave Lapan said Thursday that the probe will look at the actions taken by Caldwell and his staff and determine whether they were inappropriate or illegal."